Terrabacter sp. strain DBF63 is able to utilize both dibenzofuran and fluorene as sole source of carbon and energy (Monna et al. 1993) and to cometabo-lize a broad range of chlorinated dibenzo-p-dioxins and dibenzofurans (Habe et al. 2001, 2002). Dibenzofuran degradation is initiated by angular dioxy-genation, catalyzed by the oxygenase DbfA (with unknown electron transport proteins). The chemically unstable dihydrodiol formed in the enzymatic reaction is spontaneously rearomatized to 2,2',3-trihydroxybiphenyl, which undergoes DbfB-catalyzed meta cleavage. Hydrolysis of the meta cleavage product by DbfC protein yields salicylate, which is metabolized via genti-sate or catechol. Since the dbfA1A2 genes are located on the 160-kb linear plasmid pDBFl (as well as on its putative derivative plasmid pDBF2; Table 1), whilst the dbfBC genes are located on the chromosome, mineralization of dibenzofuran by strain DBF63 requires the presence of both replicons (Nojiri et al. 2002). Remarkably, genes showing more than 98% identity to dbfA1A2 of Terrabacter sp. DBF63 were found in Rhodococcus sp. strain YK2 (Iida et al. 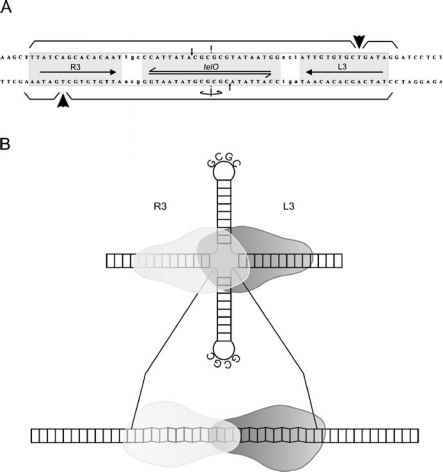 2002b), suggesting horizontal DNA transfer between genera. Plasmid pDBFl is not only involved in mineralization of dibenzofuran, but also carries all the genes necessary for the degradation of fluorene to intermediates of the tricarboxylic acid cycle (Habe et al. 2005; Table 1). Oxidation of fluorene (Fig. 9) is also initiated by the angular dioxygenase DbfA, which in a monooxygenation reaction yields 9-fluorenol. 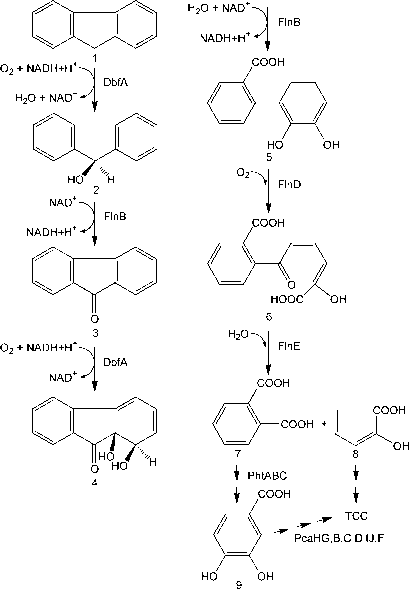 Subsequent oxidation by the dehydrogenase FlnB results in 9-fluorenone, which is attacked again by DbfA to form 1,1a-dihydroxy-1-hydrofluorene-9-one in an angular dioxygenation (Habe et al. 2004). The latter compound is oxidized by FlnB to 2'-carboxy-2,3-dihydroxybiphenyl, which undergoes meta cleavage and hydrolysis; however, chromosomally encoded DbfB and DbfC are not involved in these reactions (Nojiri et al. 2002; Habe et al. 2004). Instead, the heterodimeric extradiol dioxygenase FlnD (the product of flnD1 and ORF16; Table 1) is responsible for meta ring cleavage of 2/-carboxy-2,3-dihydroxybiphenyl, and subsequent hydrolysis of the meta cleavage product to form phthalate is catalyzed by FlnE (Habe et al. 2004). Phthalate conversion to protocatechuate is encoded by the pht gene cluster, which is located adjacent to the fln genes. The pDBF1 plasmid also harbors the pca operon coding for protocatechuate catabolism to succinyl-CoA and acetyl-CoA (Habe et al. 2005). Such plasmid localization of 3-oxoadipate pathway genes is remarkable, since it is generally assumed that catabolic plasmids usually encode peripheral pathways, whereas genes of central pathways reside on the chromosome. As mentioned above, the pca genes of R. opacus 1CP and Rhodococcus sp. strain RHA1, for example, are indeed clustered chromosomally (König et al. 2004; Patrauchan et al. 2005); in Strep-tomyces coelicolor A3(2) they are located on the central, stable region of the chromosome (Iwagami et al. 2000). Two other dibenzofuran degrading actinobacteria, namely Terrabacter sp. DFA1 and Janibacter sp. DFA10, show the same organization of the pht and dbf-fln gene clusters as strain DBF63; however, their localization on distinct replicons has not been investigated yet (Noumura et al. 2004). Since several putative transposase genes or IS-like elements were found around the pca and dbf-fln gene clusters in strain DBF63, Habe et al. (2005) suggested that the pca genes were acquired via transposition events and subsequently distributed via horizontal plasmid transfer.